With a busy Wednesday and an even busier weekend, the last few days have changed the smartphone landscape. The most hotly-anticipated event proved to be the Samsung reveal, which opened up with Samsung’s first foldable phone, introduced its first 5G phone and even had time to announce three Galaxy S10 flagships. That event topped the chart in last week’s poll with nearly half the votes. The Xiaomi event (which was on the same day) sits in third place. Perhaps the Mi Mix 3 5G reveal from this Sunday and the European pricing of the Mi 9 will give Xiaomi a few more points on the excite-o-meter. The vivo event for the V15 Pro didn’t draw much hype – three events in a day was probably a bad idea. 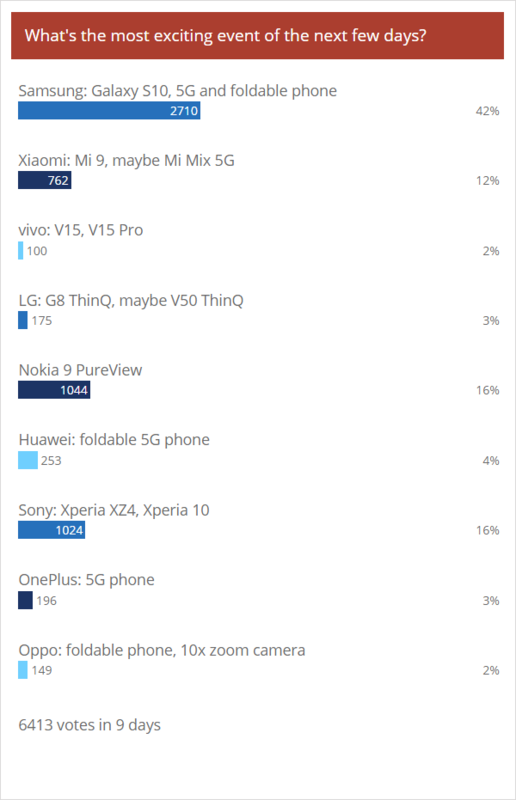 Anyway, it’s interesting that we have a tie for second place – the HMD event, which brought the Nokia 9 PureView and a few more phones, and the Sony event both scored 16% of the vote. The Nokias were unveiled this Sunday, the new Xperia 1 will be unveiled on Monday. While early hype was equal, things may change as rumors give way to official information – and our hands-on reviews, of course.